It seems quite fitting to be soaking in this music during the dark, sombre nose of 2016. This is a cynical kick-back four song drone that carries all the dreamy resignation of Leonard Cohen's 'Everybody Knows'. In places, I am surprised to discover, it is every bit as beautiful too. Well, perhaps I shouldn't be surprised. At the heart of Dark Actors – a project that has been evolving for several years, or so it seems, sits the techno-wizard Mike Eastwood, once the guiding technical light of Factory Records and, levelly, A Certain Ratio. Known as Mikey in the Factory Office, and as producer Moist elsewhere, he seemed always an amiable fountain of electro-knowledge. Odd that he didn't gain a single mention in James Nice' Shadowplayers, the 'necessary corrective' tome of all things Factory. Even his band, Lavolta Lakota, who released one Factory single, only received a single cursory nod. No matter. Eastwood's ambiguous role in this, as 'curator' it seems sits levelly with mastering genius, Jon Pennington. That apparently, is all you or I need to know. The true cast here are formed by an anonymous group of players, "some famous, some unknown, all off the grid." How gloriously Factory-esque. The Wilson led-tradition of telling journalists absolutely nothing, or worse, a web of misguiding info then complaining when the subsequent writing took an ambiguous twist, is continued here. Welcomely so. I had to suppress a wry smile when Eastwood, who I respect and like hugely, admitted to be "struggling slightly" with this release. Irony upon irony then. But this is worth pursuing, for the hypnotic lift offered by these four outings, "growl" rather than "drone", seems to capture this moment to absolute perfection. As I write, post-Bowie and with news of further high profile deaths serving to nudge fears of huge scale war into the shadows, it is rewarding to lie back and allow this to pour brusquely in. 'Black Maria' opens the show. A tirade of observant journalese or conspiracy babble, depending on your stance, it uses a cartoon image of the old police tactical control van – 'Black Maria' – as it's central image. This is cemented by the simplistic accompanying video which depicts the vehicle crawling through a straight line of lyric. Hypnotic indeed as image, lyric and growl combine to send your thoughts scuttling back through Britain's dark governing heart, then and now. That is the message. Then as now. The second track, 'Waterboard' picks up the pace while maintaining the vocal growl. An almost playful squint at, among other evils, American internment policies. "Maybe it's me, suffering from crass complacency,” drawls the unknown vocalist, now sounding as if he has spent the afternoon drinking moonshine and smoking Havanas before a mass brawl and finishing up in some Louisiana gutter. It certainly don't sound like it came out of a Manchester suburb. By contrast, arrives the neatly placed simplistic bounce of 'Questions', in which the title is repeated over a clippy bounce track ploughing a furrow to nowhere. 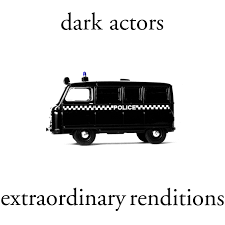 This is Dark Actors slipping into punk mode via Art Of Noise deviations. And what a fun-time interlude it proves. No need here, for the casual listener to actually have to work at it. This short break in the proceedings can be views as temporary relief. For the final cut, 'Sheep' returns to the unforgiving drone that so enticed us at the start. By now the vocals has assumed a bank manager's air of sensible authority, where a careful delivery carries a sense of foreboding, if not sheer menace. Lyrically, it could be swiped from the cult conspiracy film, Zeitgeist, where monetary shenanigans is placed levelly with tales of illuminati. Tray not to listen after pouring over your bank statements and, a direct tip from me this, have a glass of port – or similar – close at hand. Well, all this refreshingly subversive entertainment emerges on the polished Hacienda Records which also promises outings for the newly minted Factory Classical, featuring Mike Pickering and sundry side-kicks. It does have a welcome flavour of early ZTT. A label whose literary stance effectively transcended the movements of its enigmatic artists. That stylish statement was, of course, wiped clean away by the runaway and, as time passes, ultimately unrewarding success of Frankie Goes To Hollywood. But the world has changed and one cannot envisage such outrageous fortune here. This is dark fun and a glimpse at something I had thought might be lost forever.